The meeting was called to order by President Lorrie George-Baskin at 7:32 a.m. at Panera Bread. Connie Kraly gave the invocation, and the Pledge of Allegiance to the Flag was recited by all. Members Present: Lorrie George-Baskin, Robert Frank, Kelly Garcia & Maria of Mano-A-Mano, Sherry Ridge, Danielle Theobald, Jeanne Kearby, Julie Richey, and Connie Kraly. 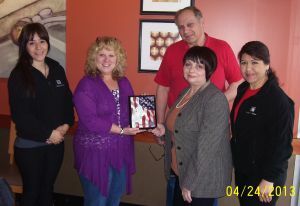 Sherry introduced Mr. and Mrs. Chuck Husk of Round Lake Beach, the parents of our Home Town Hero for April. Chief Petty Officer Brian Husk is a 20-year man, married with three children. Sherry presented them with the HTH plaque and a blue star pin. There will be a pizza party on Thursday, April 12, for the student letter-writers to our Home Town Heroes. It will be at 4 p.m. in the high school cafeteria. A Minute for Exchange: Connie encouraged all officers to attend the Officers’ Training at State Bank of the Lakes on Saturday, May 4, at 10 a.m. Also, let her know if you are not receiving the “Lincolnland Link” and the “Exchange Today” magazine. Treasurer’s Report: The balance in the Operations Account: $3,760.43, and Service Activity Account: $3,510.34, for a total of $7,270.77. Motion to approve the report as presented was made by Connie Kraly and seconded by Jeanne Kearby. Motion carried. The report will be filed for audit. Secretary’s Report: The minutes of April 10, 2013, were approved as presented on motion of Sherry, seconded by Julie Richey. Memorial Day Parade: Connie Kraly reported will may have the assistance of Venturing Crew and National Honor Society members. Parade is set for 10 a.m. on Monday, May 27; all are invited to participate if possible. Bike Safety: Danielle may start this year with a poster contest held in our schools. Still investigating the project. Anyone who would like to help, please contact her. Freedom Shrine: The date is set for May 9, 2013, 10 a.m. at Indian Hill School. Lisa Rusch is the chairperson. Her father was in a very bad motorcycle accident and Judy will take over to help out with the project. If you know someone to receive an invitation from us, please let her know. There will be District-wide officer (and member) training at the State Bank of the Lakes in Grayslake on Saturday, May 4th. This workshop is very beneficial for all board members, and all are encouraged to attend. Our next regular meeting will be Wednesday, May 8, 2013, at 7:30 a.m. at PANERA Bread. The Lincolnland District Convention will be June 20-22, at the Holiday Inn in Gurnee. The committee meets every Wednesday 5:30 to 6:30 p.m. The convention is being hosted by the Lake County Chapters. Early discounted registration is due by May 15, 2013. All registration due by June 1st. All recited the Covenant of Service. Meeting adjourned at 8:07 a.m.